When Volvo embarked on releasing the 2015.5 S60, they didn't just focus on how the car would look in vanity shots (although I think we can agree, it does look mighty fine). Instead, they used human-focused design to improve upon the car in its second-gen iteration. The result? A driving experience that feels like it was designed with the driver in mind. Approaching the S60, you know it's a car you won't lose in the parking lot. The 2015.5 design looks fresh and distinctive without being showy. It's unmistakably Volvo. It has presence, and the profile is quite sporty. Curves accentuate the wheel wells, the wheels are large and attractive, and there's a minimal amount of fender gap. It just looks capable. But it's not all about image. The cool, modern roofline is just one example of how the design caters to the driver and passengers. That swept roof allows rear passengers to enjoy headroom that was unheard of in a sedan just 10 years ago. A 6'3" person can sit in the backseat comfortably without bumping his head against the ceiling. That's right: rear seats are no longer reserved for kids and very short people! And while that tall guy basks in his newfound space, he might notice that the HVAC vents are located in the B-pillar, near his face. Most cars place the rear vents behind the center console, which is great if your knees are hot but kind of a missed opportunity otherwise. This is one of many examples of the S60's common-sense design. But let's talk about the front of the car for a second. The driver's seat can memorize the preferences of up to three different drivers, which prevents the frustration (and profanity) of manually readjusting every time you swap seats with your spouse. The steering wheel is appropriately thick in the hands, and the stitched leather feels money. The switchgear is located in a logical place, and the car's one-stop operating system, Sensus Connect, blends infotainment, navigation, and car settings into one intuitive dashboard. The S60 also has a ton of driver aids, but they don't make you feel like you're being nannied. If you've ever pushed a modern family sedan hard, you were probably reeled back in by warning lights and tones. Maybe an overly protective control system cut the gas or even applied the brakes. The S60 offers a surprising amount of free reign in this regard. I recently test drove one down a more industrial section of the city. This particular Saturday morning had the place abandoned, and begging for testing. When making a turn on a curvy road (one which may have been taken at a slightly higher-than-suggested speed), the S60 is quiet and capable. Normally test driving a new car makes me a bit nervous, but I had no such issue in the s60. The steering feels logical — the steering wheel responds just how you want it to, which translates directly to the vehicle making the turn with aplomb. I hauled the Seashell Metallic beauty onto the interstate, the turbo four roaring, and as I quickly reached highway speeds, still on the weird double s-curve on-ramp, I actually smiled at the lack of float. No protesting tires or understeer. 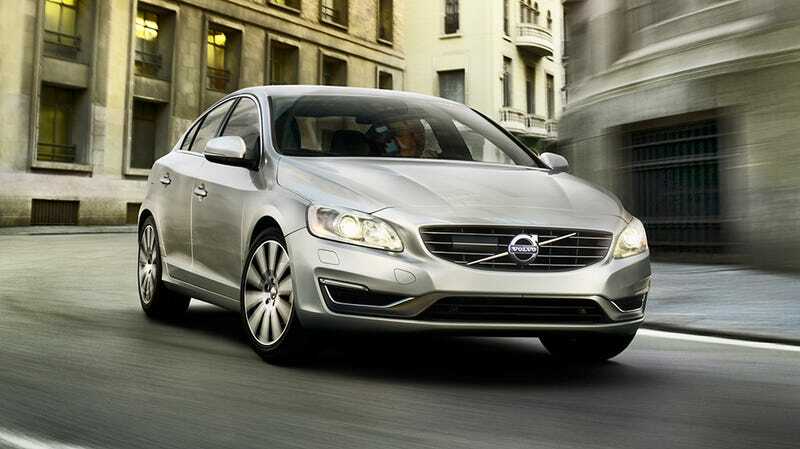 The S60 is a sport sedan that's easy to drive. This is brilliant because it allows the driver to focus on the act — the enjoyment — of driving. It's not grandma steering, where you have to overthink every turn and steering wheel movement. This is intuitive, and it makes the day-to-day commute more fun. And make no mistake — the S60 is fun. In fact, it's one of the most fun front-wheel biased cars I've driven in a long time. While there is a hint of body roll in the base model, you can feel what the vehicle is doing and how you can correct it. The steering response has the proper amount of weight and feedback, and the power assist is there without being annoying. Whether your commute is full of twisty, back-country roads (lucky!) or more of an urban grid, the S60 will help you enjoy the drive by letting you drive — and properly communicating with you when you do it. The S60 boasts one particular driver aid that I'd love to see on more vehicles: Corner Traction Control through Torque Vectoring. On a curve, this system slightly brakes the inside wheel and transfers torque to the outside wheel, allowing you to maintain a higher speed through the turn. Pretty sweet "safety feature." I asked the sales guy riding shotgun if we could take it up to Hallett Motor Racing Circuit to fully test the Torque Vectoring. He thought about it a moment, but (rightfully!) said no. An entire book could be devoted to Volvo's "safety first" achievements over the years, and the latest is IntelliSafe. It's Volvo's complete approach to safety, and it covers everything from mandated regulations like pedestrian-friendly bumpers, to above-and-beyond features like anti-submarining seats and blind-spot notifications. IntelliSafe is proof that safety isn't just a slogan — it's built into the design. You can feel it when you're sitting in the driver's seat. While headed down a busy-ish expressway, I glanced around and noticed it was easy to see out of. Rather than the cramped tank-like feel of a typical sporty car with a high belt line, the S60 feels like a greenhouse with all the windows and clear sight lines. Refreshing these days. Also, the feel of the interior layout gives you the sense that you're sitting in a solid piece of armor. Seriously. It reminded me of the time I sat in an A-10 Thunderbolt II, surrounded by the airplane's "titanium bathtub" armor. While I love old cars that feel inherently dangerous because of their lack of driver assistance, there's also a place for the safe commuter car. Especially one with this kind of acclaim: 5 stars in EuroNCAP, 5 stars from the NHTSA, and a Top Safety Pick+ from IIHS. If the S60 had a Twitter account, it would probably end all safety-related tweets with #MicDrop. Add it all up, and you start to see the big picture. Elegant, but functional and logical. Smart, innovative, and responsible. Volvo has purposefully designed this car to elicit an emotional response. You know intrinsically when good design is on, when it feels right, when it works. That's the feeling you get here. This was a car designed with the driver in mind. So what parts of your driving experience could stand to be improved? What design elements do you appreciate during your commute? Let me know in the comments.